If cleaning up fall leaves – all that raking and bagging gets you down – there’s an easier way to do this job. Give yourself, your garden and the environment a break this fall by keeping and reusing the bounty of fallen leaves, instead of dragging them to the curb. More than half of the nutrients absorbed by leaves during the growing season are still present in the fallen leaves. They are just waiting to be put to good use to enhance your lawn, garden and compost pile. The best way to use autumn leaves is to chop them up first. You don’t even need to rake them up – simply use a gas powered lawn mower set at the highest deck height to mow your leaves into confetti. A sharp blade and your normal mowing speed works best. 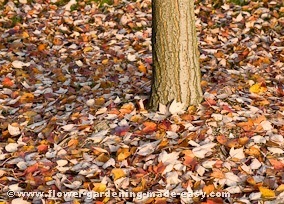 Spread the leaves if necessary so they are no more than 3 to 4 inches deep. It’s best to mow when leaves are damp from morning dew (but not sopping wet from rain). That way they won’t fly around as much, or set off allergies if you’re susceptible. You may have to run over them twice. Left in place on the lawn, they act as free fertilizer, returning nutrients and organic matter to the soil. According to many years of research at Michigan State University, lawn grass benefits greatly from having ground-up leaves left on the surface. Even a thick layer will not harm the grass. By spring the leaf remains will not be visible and the lawn will return thicker and more luxuriant. Spread over top of your perennial beds, fall leaves act as winter mulch, providing an insulating blanket, and they improve soil quality as they break down. Leaves also make a good mulch for newly-planted bulbs and other fall plantings that may be susceptible to frost heaving. In the vegetable garden, till chopped up leaves into the soil. They will decay much more readily over the winter than leaves left whole. In the spring the soil surface will be free of clumps and clods of undecayed leaves so that sowing seeds is less of a chore. Cleaning up fall leaves and placing them near your compost pile, ensures that you have an excellent source of “brown material” to help in the composting process. A covered container of chopped up leaves is handy to dip into and scatter over each addition of vegetable matter to the compost pile. The leaves balance the green matter in the pile so that the break-down of the materials will happen more quickly and thoroughly. 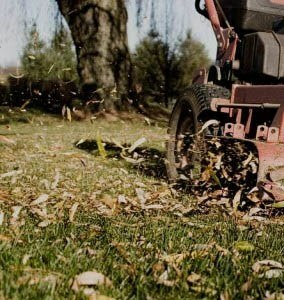 Clean up fallen leaves from your lawn at least once a week. Don’t leave the job until every last leaf has come down. If you don’t deal with the leaves in a timely fashion, they can smother your lawn and weaken it. Your lawn still requires sunlight in fall because the turf plants are working hard to store sugars their roots to promote good growth for next spring. Don’t use leaves that are diseased with rust, tar spot or powdery mildew. Leaves from black walnut trees should also be avoided, as walnuts contain a toxin that inhibits the growth of some plants. Small leaves such as those from willows and honey locust can be used as is, without chopping. But larger leaves such as those from maples and oaks are best chopped up with your lawn mower. Recycling all those lovely leaves into your yard and garden beds is much easier when you can dispense with endless raking and the blisters it can cause.